What's The Most I'll Ever Have To Pay Out Of Pocket? What’s The Most I’ll Ever Have To Pay Out Of Pocket? Most out of pocket for my insurance? How much do I really owe? Great questions that has made many ask when navigating through the ACA (affordable care act) plans. Why is this confusing? Well, it is not what many employees have had to deal with because their group insurance has been taking care of them. But since the new ACA laws more and more employers are quitting providing group insurance and have their employees navigate this on their own. Here is the good news: You can get platinum ACA plan with under $1,000 our of your pocket. However, you will be paying big bucks ($$$$$) for this policy. If you want the top of the line, then you will be paying a pretty penny. The great news is now you know in basic English what your out-of-pocket maximum (called OPX) will be. For 2015 the worse case out of your pocket will be $6600 per person. Of course you can pay “up” and get a less out of pocket if you want. What’s Really The Most I’ll Ever Pay Out Of Pocket? 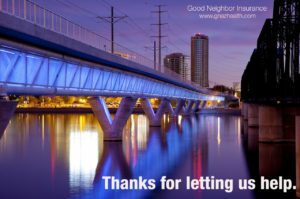 Good Neighbor Insurance provides group and individual health care coverage in Arizona, as well as travel insurance for those vacationing overseas and for expats residing overseas. We are happy to be able to share the following information for our clients who currently have individual coverage. Out-of-pocket maximum/limit by definition is the most you pay during a policy period (usually one year) before your health insurance or plan starts to pay 100% for covered essential health benefits. This limit must include deductibles, coinsurance, copayments, or similar charges and any other expenditure required of an individual which is a qualified medical expense for the essential health benefits. This limit does not have to count premiums, balance billing amounts for non-network providers and other out-of-network cost-sharing, or spending for non-essential health benefits. Let’s look at an example: You have a deductible of $1,000, a coinsurance of 20%, and an out-of-pocket limit of $5,000 per year. You break your ankle when you trip over your dog while walking down the stairs. You’re taken to surgery that night. Your surgical site becomes infected. You’re hospitalized for two weeks, have two surgeries, and get IV antibiotics at home through home health care for another three weeks. Your emergency room bill is $4,000. Without an out-of-pocket limit, you pay the $1,000 deductible and $600 in coinsurance. With an out-of-pocket limit, you pay the same $1,000 deductible and $600 in coinsurance. Your hospital bill is $40,000. Without an out-of-pocket limit, you pay $8,000 coinsurance. With an out-of-pocket limit, you pay only $3,400. You’ve reached your out-of-pocket maximum and you stop paying. Your home health care bill is $3,000. Without an out-of-pocket limit, you pay $600 coinsurance. With an out-of-pocket limit, you don’t pay anything. Your health insurer pays the entire cost of your home health care because you’ve already reached the out-of-pocket maximum. The total cost of your broken ankle is $47,000. Without an out-of-pocket limit, you pay $10,200; your insurer pays $36,800. With the out-of-pocket limit, you pay $5,000; your insurer pays $42,000. You need more health care services later in the year. Without an out-of-pocket limit, you pay the 20 percent coinsurance. With the out-of-pocket limit, you pay nothing. Call one of our agents at 480-633-9500 or email us with your questions at info@gninsurance.com. Blog Home > 2014 - 2019 individual and family > What’s The Most I’ll Ever Have To Pay Out Of Pocket?